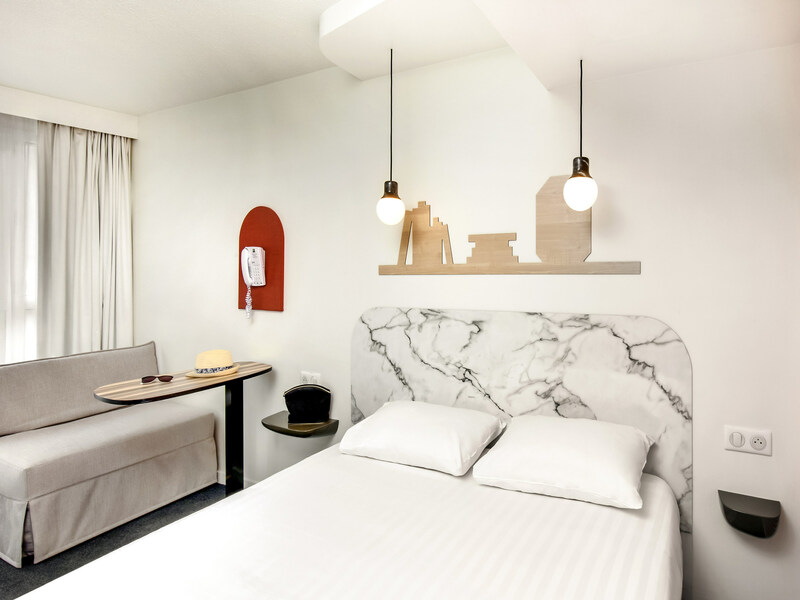 2 connecting rooms that can sleep 2 adults and 2 children, with microfiber pillows, a soft duvet, mattress topper (3"/7 cm thick) for greater comfort, a 32" LCD television, free unlimited WIFI, air conditioning and a hairdryer. Room for up to 5 guests, with 1 double bed, 1 double sofa bed, 1 single sofa bed, microfiber pillows, 26-in LCD TV, free unlimited WIFI, air conditioning and hair dryer. Cheerful welcome upon our late arrival. Clean and nicely decorated rooms. A breakfast to please most. We are stopping there twice a year and had always had a good experience. We were disappointed on arriving there was no space to park in the car park as one of our reasons for picking the hotel was available parking. The room was very small, with no real cupboard space. Our key also had to be reset most days as it seemed to be forever not working. The location is good and the limited amount of free off-street parking useful. However the rooms were very small with tiny shower rooms - limited hanging space. Air conditioning was efficient and not noisy. &quot;ibis Styles is about creativity, good humor and fun. Each hotel is decorated around a theme&quot; says the advertisement. Just not true here. We have stayed at budget, ibis (standard) and a couple of other styles. No comparison with Nairobi or Brussels for example. Not as good as other Styles, smaller rooms. Breakfast OK. Somewhat overpriced. - rooms too small - breakfast with very limited choice, particularly when you go down to the breakfast room at 9.a! - door key had to be reactivated every day... - too expensive for that standard. Staff are excellent. Coffee, tea accessible at all times. Welcome choice of drinks (non-alcoholic) from drink compartment on arrival. We were given a bigger room. Extremely quiet just a little warm in the night. Breakfast copious - great choice and a good buffet. Pretty central, river close by, main shops. Great parking availability. It was fine, breakfast time was a bbit hetic, too many people queuing. CORRECT. SITUATION ET PARKING INTERESSANTS. JOLIE SALLE A MANGER. The Ibis Styles hotel in Vichy was exactly what we were looking for! Situated in the centre of Vichy and near to the Lac d'Allier, it was close to all we wanted to visit. The welcome was polite and helpful. The rooms are exactly as expected. No extremes, just correct value for money! The breakfast was nicely offered in buffet style. Great fresh coffee, fruit juices and a reasonable choice of french breakfast. We will be visiting this hotel again in the future! Stayed for Ironman Vichy. Good location. Free parking excellent. Breakfast very good. Coffee machine good. Only downsides - 1 pillow per person not enough and pillow was very uncomfortable. Room too small and not enough hanging space or any cupboard space for 8 night stay, would be OK for couple of nights. On last day there we came back at lunchtime and cleaner had left our room unlocked and the room door open. Bearing in mind there was an expensive triathlon bike in the room as well as the rest of our possessions we were quite shocked by this. We had a disappointing stay at the IBIS STYLES in Vichy. It certainly wasn't up to the usual IBIS standard. The staff on reception at check-in was disinterested. The room was tiny (&amp; we stay in IBIS hotels regularly). The range of food at breakfast was very poor, eg. No fruit (dried or fresh) or eggs. Just oranges for the juicer. The layout of the breakfast buffet was chaotic. There were crates piled up in the dining room making it look like a warehouse. We would not return or recommend others to stay.